So Kennedy's photo shoot @ The Picture People turned out so darn good - to bad I can't figure out my stupid scanner so that I can upload them for all to see. ARGHHHH!!!! We got some really good picutres of Kennedy and her cousin Brennan. You can see just how much Brennan loves Kennedy! Kennedy's seizures were getting worse and worse. She was having more and more episodes. I had put a call in to her Neurologist to find out what he wanted us to do. At first we were told to increase her Keppra to the maximum dose allowed for Kennedy's age and weight (2ml/2 times a day), however, that did not work - no suprise there. Her seizures were not letting down. So then Dr. Michelson prescribed us a new medication to take in conjunction with her Keppra. So far so good :) Kennedy is now taking two medications to control her seizures - Trileptal & Keppra. The medication was prescribed on Friday and since then Kennedy's seizures have begun to decrease and as of today she has only had one episode!!!!! 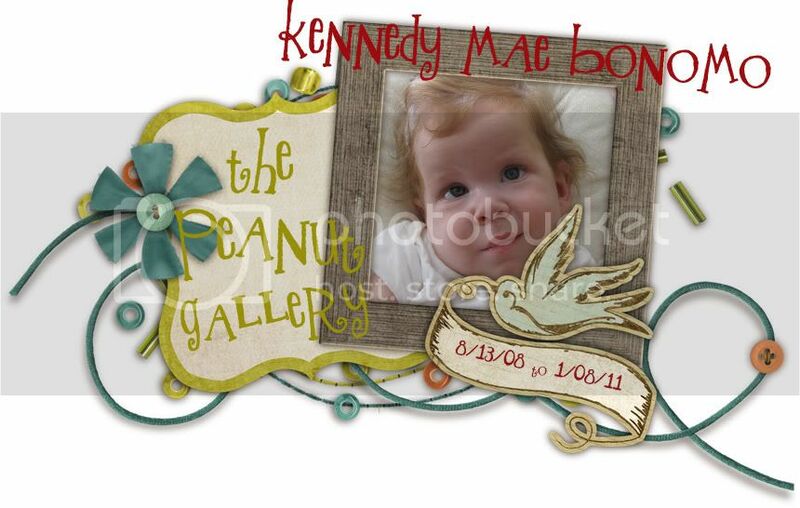 Also, Kennedy and her cousin Brennan had a photo shoot on Sunday at The Picture People. The photos turned out great. As soon as I figure out my scanner I will post them for all to see. Still waiting for March 31st - well keep you all updated! We are back to having seizures!! We were one day post Phenobarbital and Kennedy's seizures have started back up. Geeze......Why is it that the worst drug out their (Phenobarb) seems to be the only drug that is controlling her seizures? I called the Neurologist for some advice and received a very frustrating 3 part response - try to increase the dose of Keppra, stop Keppra and put her back on Phenobarb, or take her to the ER. Back to the ER - for what. They don't even know what to do with her at the ER. They just look at us with blank stares like we are a medical anomaly (which I guess we are) but who wants to be looked at like that - it is not very comforting. We have two options when going to the ER - drugs or inpatient. They will either drug her up and send us home or admitt us for more tests which will result in NO answers.....HMMMM!!!! Can March 31st come already???? So Daddy and Kennedy had a good day today. Brian took toady off to take Kennedy to her MRI so I could get caught up at work. Her MRI went great. They tried to perform the MRI without sedation, however, it was not successful. So the actual MRI took longer then anticipated because they had to place the IV and administer the sedation once they took her back. After the MRI it took Kennedy awhile to wake up from the sedation. So now we sit and wait for the results.....Our appointment with the Neurologist is Tuesday, March 31st. They can't live with each other they can't live without each other. Tomorrow is the big MRI - Hopefully they will be able to tell us something. I just hope they don't make us wait until our appointment at the end of the month. Thanks again to everyone for all your thoughts and prayers. Next week Kennedy will have her long awaited MRI/MRS!!!! I will keep everyone posted. Tomorrow Kennedy will be having surgery to get her peg tube replaced with a Mickey Button. This is normally a simple procedure performed under sedation, however, Kennedy will be placed under general anesthetic and intubated (Yikes - I hate this word). The reason she will be placed under GA is because the doctors still don't trust her breathing. Due to her extreme hypotonia, they just don't know if she will be able to breath on her own while under sedation - which causes your muscles to relax. I am grateful for all her doctors. They really follow their intuitions when it comes to Kennedy, and thus far, they have never led us down the wrong path. I would rather them be safe then sorry. It is so much safer to have intubation take place before the procedure then in an emergency situation - that is when problems arise. Please say a little prayer for Kennedy tonight! I believe your thoughts and prayers have been a big part to her success!